What exactly comes into your mind if you think about the color white? You will think of paper, milk, maybe teeth or little lambs. But I am very sure that you would not think of a beetle. But it is a beetle that comes in a white that is more white than all other white things you most likely have in mind. 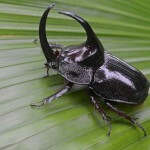 The beetle goes by the name of Cyphochilus, it is native to South-East Asia. The reason for its pearly-white appearance is a thin layer of a highly reflective natural photonic solid in the beetles scales, as ZME science writes. Cyphochilus gained this ability during a long evolutionary process to become invisible among its close neighbors, an also very white funghi. And this has a great advantage: the better the disguise, the more likely the beetle will survive, as birds can’t see and eat it. For humans the ability of Cyphochilus is important, because it could reveal the secret to develop even whiter paper, wall color, plastic or shiny white parts in tech devices. Therefore Cyphochilus is our #speciesoftheweek.